Two of the five new baby croc monitors. 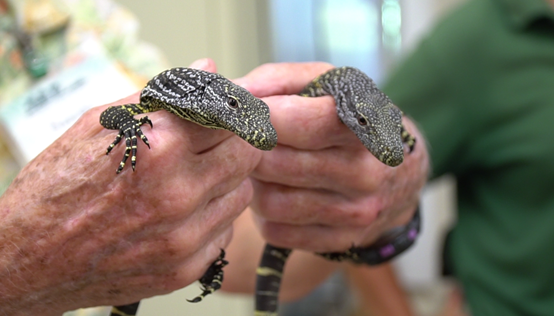 HONOLULU – The Honolulu Zoo is happy to announce that between Feb. 21 and Feb. 22, five crocodile monitor lizards were hatched at the Honolulu Zoo to parents Jimmy and Gurl. The Honolulu Zoo is among only two other zoos in the world who have successfully hatched baby crocodile monitor lizards since 1990. Counting the five new babies, the Honolulu Zoo now has seven crocodile monitors and has successfully hatched 19 others since 1999. As the gestation period is generally six to eight months, these babies were hatched after 185 days of incubation. Crocodile monitors (varanus salvadorii) are an island species endemic to New Guinea’s coastal rainforests and mangrove swamps, and one of the longest lizards in the world, growing up to approximately 10-feet in length. This is a protected species and can be difficult to propagate in captivity. There are approximately 75 crocodile monitors in 28 institutions worldwide. They are dark green arboreal lizards with yellow bands and spots, and are noted for having a blunt snout and very long tail, which primarily provides counterbalance when leaping from branch to branch. They face a variety of threats from deforestation to poaching. Crocodile monitors have sharp, long fang-like teeth which allows them to catch fast moving prey like small mammals and birds, which they stalk and attack headlong. They have a keen sense of smell and are one of the most intelligent reptiles in the worlds. The new crocodile monitors hatched at the Honolulu Zoo have developed a familiarity and bond with their keepers, and the newborns were successfully hand-fed on March 1. All five lizards are healthy and have been placed on display in the Keiki Barn nursery.